Twice in my life I have spent several days off the grid in Peru, slogging up and down the Andes Mountains on the way to Machu Picchu. Once I did it on the Inca Trail, another time on the Salkantay Trail. These two Peru treks present very different experiences, both with their pros and cons. The Salkantay one doesn’t have the ruins or the cachet of the Inca Trail; you don’t just waltz into Machu Picchu on foot via the Sun Gate for one thing. But it’s still a fantastic hike through the picturesque Andes Mountains. It has much more climate variety, from a glacier lake above the treeline to dense jungle. The Inca Trail has a lot of ruins along the way that you can only see from this trail, plus you’re on the original road the Incans walked on many centuries ago. They’re both physically demanding and both require going over a pass that’s more than 4,400 meters altitude. The 4-day Inca Trail hike is much shorter than it feels though, at 26 miles or 43 kilometers. They actually run a marathon on it sometimes.). There’s one long stretch where you’re walking down hill all day on stone steps. Even with a limit of 500 people a day, including porters, it can feel crowded, especially at the night campsites. The 5-day Salkantay trek is around 57 miles if you start at Mollepata like many independent trekkers do or 45 if you start at Soraypampa like the organized tour groups usually do. That optional first part is on a road. After that you walk on mountain paths also used by horses—step carefully! It’s usually not as crowded and not everyone stays at the same campsites on a set schedule. First there’s the cost. When I went on the Inca Trail trek in the mid 00s, my wife and I each paid $235 each, including the cost of our own porter to carry our packs. By the end of the 00s that price had risen to $430 at the same agency. Now if I were to do it again with them (Peru Treks), it would cost $735 with a half share of a porter. You’ll pay more if you need to rent a sleeping bag. And they are one of the more reasonable options: they list the prices for their competitors on the same page. This increase is obviously much greater than inflation or exchange rate changes can explain. Some of the increases are for good reasons (better pay and treatment for porters), while some are government money grabs that have nothing to do with the trail. Even those can be justified though: they’re trying to keep the numbers manageable and keep the facilities maintained, both along the trail and at the citadel. In short though, everything associated with that trek has gone up: permit fees, Machu Picchu admission, the bus down the mountain at the end, Peru Rail train tickets, and porter pay. Many of the costs for the Salkantay Trek have also gone up because of the factors above, though with that trek you have a horse carrying the goods instead of a person. You’re looking at $400 to $500 per person for that trek, including everything except a sleeping bag. Some walk all the way to Aguas Calientes, some take the local train from the hydroelectric station. Some set up tents, this one has some domes you can sleep in one night and grass huts another. You can trek independently on the Salkantay route, which is not allowed on the Inca Trail. If you set everything up yourself and have other people you can share costs with, you can do it for much less. You’ll find bloggers who have written the “definitive guide” to the Salkantay trek but are very cagey about what they actually spent, however. I don’t know if that’s because they didn’t bother to keep track or, in the end, they didn’t save as much money as they expected and it took a lot of effort. Here’s one post that did lay out the costs though, which would be $146 to $200+ depending on gear rental, campsite options, and how much you eat—that’s carrying your own pack and supplies. If you add a horse and owner, now you’re approaching the cost of just going with a tour company and letting them take care of everything. If money is no object, take the lodge to lodge trek to Machu Picchu with Mountain Lodges of Peru. That’ll cost you a few grand, but you’ll get hot showers and a comfy bed each night. The Inca Trail is a budget buster for backpackers, but one that plenty of people are still willing to spring for. Despite the rapid increase in cost, this trip is still super-popular. One agency spokesperson I interviewed more than ten years ago said you should book your trip six months ahead if you wanted to go during the high season of May through August. Now you have to book the year ahead. As I write this in January, June is already sold out across multiple agencies. Many people don’t know this or can’t plan so far ahead, so they end up on the “alternative Inca Trail”—the Saltankay Trek. There’s one version of this that joins up with the Inca Trail toward the end, but if all the permits are sold out that’s not a possibility anyway. So the more frequent option always open is to follow it all the way to the hydroelectric plant near Machu Picchu and then hop a local train at the end. This trek does not have to be booked so far ahead and in most months you could just show up in Cusco and book a tour if you’re the spontaneous type. Or take off on your own. For the Inca Trail, you have to go on an organized tour, so just pay up and let them take care of the details. Bring lots of layers, plenty of memory cards and a spare batter for the camera, and a power bank or solar charger if you plan on taking photos with your phone. As with any trek, make sure your hiking shoes are broken in and pack good socks. They should take care of all your transportation arrangements, though be sure a train back to Cusco or at least Ollaytantambo is included. If not, pay them to get the ticket(s) for you. If you book with a tour company for either option, they’ll give you a detailed list of what’s included, what’s not and what you need to pack. You generally don’t need to worry about food if you’re on an organized tour. You’ll have a cook preparing meals, they’ll be handing out snacks, and they should be taking care of water purification by boiling. Though it’s good to have your own water purifier in case. There are no streams you can drink from directly on the Salkantay trek unless you have a Lifestraw because even at high altitude, there’s livestock grazing in the fields. On the Inca Trail, porters carry everything, including propane tanks for cooking. You carry your own pack if you haven’t paid for an optional porter, or just a daypack if you have. On the Salkantay route you travel with pack mules or horses instead of porters unless you’re totally self-sufficient, slogging along with a tent, sleeping bag, and food. If you go with a tour company all this is taken care of in the price. If you go on your own—not possible on the Inca Trail but possible on the Salkantay one—you have to hire your own mules/horses and mule drivers at the town closest to the start of the trek. Plan to get there a day or two before to work it out. You don’t need a permit for this route. 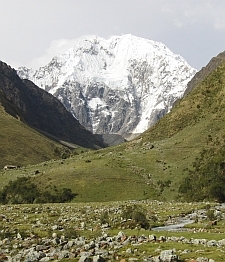 The main advantage to the Salkantay hike is scenery, glorious scenery. The photo above and to the left here are what you see near your campsite at the end of Day 1. Yes, Day 1! You see Huamantay (top pic) on one side of you and Salkantay (second pic) on the other side. It’s a bucolic scene of pastures, horses, glacial streams, and massive snow-capped mountains. Spectacular! Then the shot below is what you see after crossing the 15,000-foot pass and heading down the other side, on Day 3. You get much closer to the high mountains on this trek. Then it’s narrow valley after narrow valley through the mountains, great vistas the whole way. You go through a lot of different elevations and ecosystems, including a high jungle day where you had better be smearing on some heavy-duty bug repellent. I think I heard the critters laughing at my 7 percent DEET I picked up locally at the last minute. I got devoured after wearing shorts that day and I’m still scratching. Overall, this trail is a great alternative, but be advised that it’s tougher and rougher than the Inca Trail, especially if you try to cover all that ground in four days instead of five. Showers or baths? Usually no, unless you’ll willing to brave the chilly streams or take a dip in the river. Whatever option you choose and how you choose to do it, at the end you get to the glorious site above: Machu Picchu. Make sure you still have a lot of leg stamina left if you decide to hike up Huaynu Picchu at the end. Unfortunately, you have to anticipate this in advance now and buy your ticket ahead of time.